The annual meeting of the Society for Neuroscience (SfN) is amazing: fresh content, amazing speakers, a galaxy of satellite meetings, social events and neuro-twitter VIPs social gatherings (sfn banter). However, the program is HUGE and finding the right stuff (abstracts, events, people …) is a daunting task that may take weeks of careful planning … and frustration. -On average the SfN meeting features >17,000 presentations spread across 5 full days of conference. Navigating the conference program (topics, techniques, affiliations, authors …) requires a functional – I would say smart – tool! Unfortunately, the search tool offered by SfN – Oasis’ Neuroscience Meeting planner (NMP) – is nowhere near the standards we are used to: we’ve all been spoiled by Google! The NMP just feels weird. Don’t get me wrong: the website does what it is supposed to do but to make it work YOU have to adapt to ITS OWN “philosophy”. Long story short: it feels old and it does not incorporate many of the UX principles that make browsing the web in these days such a pleasurable (and fruitful) experience. 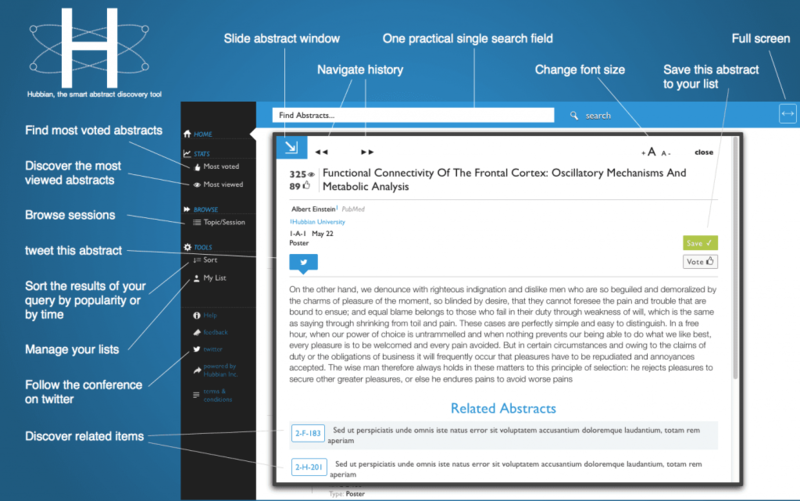 I wanted to exploit the semantic relations between the abstracts to build a network of fully-connected and browsable abstracts. 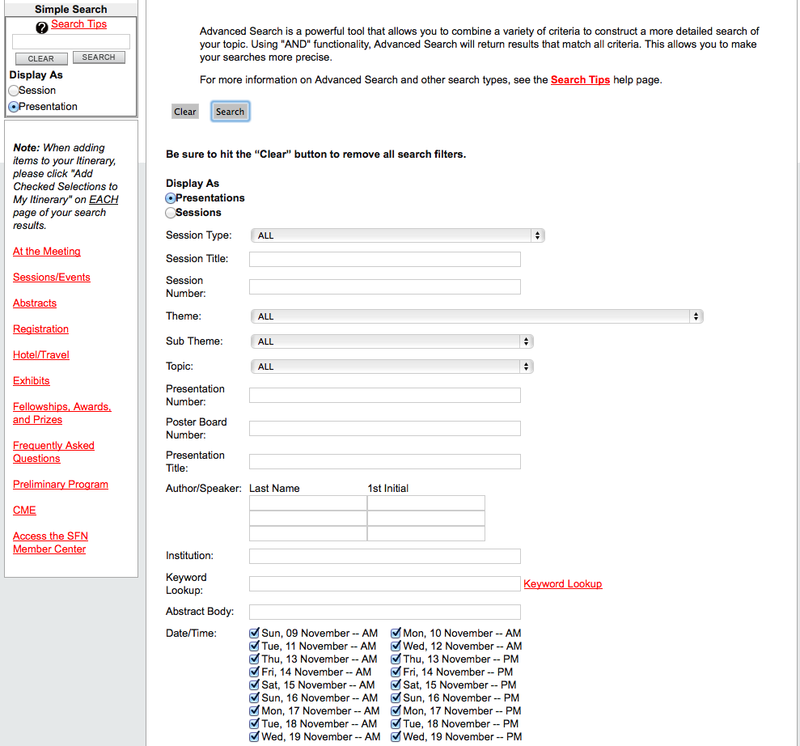 This “live data” would enable the users to filter/sort the query results by popularity (i.e. the number of views/likes or number of times the abstract has been saved in itineraries). 3 – Just one damn search bar and one damn page! I believed that the combination of these features would provide a “saltatory” and intelligent navigation therefore enhancing the discovery of relevant abstracts. I then teamed up with 4 fellow neuroscientists (not sure if they want to be named at this stage of their career 😀 ) all with complementary skills and we managed to have a functional web-app. We just needed two more things: the content (i.e. SfN’s abstracts) and a name for our web app. I felt strongly connected with the growing movement of the Hackatons: to get people together to improve the status quo for the benefit of the citizens/fellow scientists. So, HackSfN felt just about right! Let’s get the content (i.e. abstracts)! We went full-speed and scraped the content from the NMP. Ouch! that was not nice. Going back, I would do things differently. We tried not to overload their servers – we performed a ‘gentle’ scraping. However, that was not the way to go. But we got the content, loaded it up on our web-app at hacksfn.org and we were live! We promoted the app through twitter, emails … and we went viral! … well, not really, but people liked the idea and the app spread among some tech-enthusiast (we were popular among the ‘pre-chasm’ crowd of innovators and early adopters – see “Crossing the Chasm” by Geoffry Moore). Not long after we went live, we received this document from SfN’s lawyers. It has recently come to our attention that you and a team at Sciple.org have launched an app named HackSFN that is being promoted in relationship to SfN’s annual meeting, Neuroscience 2012, to be held in New Orleans October 13-17, 2012. Your app currently violates restrictions on the use of SfN’s trademarked acronym and violates our copyright of the annual meeting abstracts without our written permission. SfN appreciates the innovative and potentially valuable service you are working to provide, and would like to suggest an alternative solution that would advance the interests of Neuroscience 2012 attendees, which is our shared goal. SfN’s abstract data cannot be used without a limited license agreement and we would only consider licensing the abstract data. Awesome! 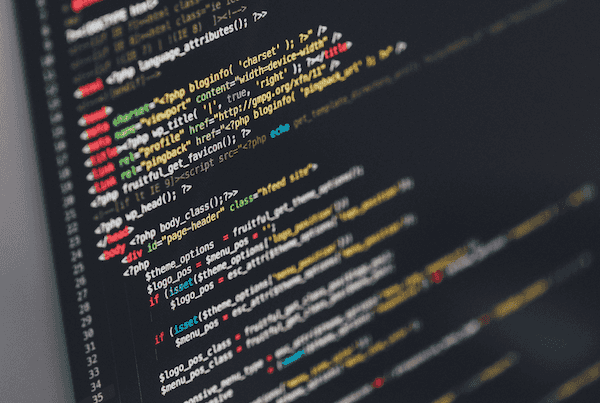 They came forward with a really good solution – that we we were absolutely not aware of: a license agreement for abstract data use. At that point I felt I owed them an apology for overstepping SfN’s policy and grab the data. That was wrong. Actually, we had no idea we were doing anything wrong … we were just being very naive scientists chasing after the data! The acronym “SfN” and “Neuroscience 2012” are trademarks of the Society for Neuroscience and cannot not be used at all in the app name, or at any time in descriptions of the service without our review and permission. This is weird: I cannot develop an app/service that has the name Neuroscience and the date in its name/url. It felt like they owned the Neuroscience word/world -… sadly, this may be true on so many conceptual, social and scientific levels … but this is another story 🙂 – But hey! This is the ‘law’, we will change the name! We object to an app that associates our abstracts and/or our meeting with a perceived confrontational term – in this case “hack” — as part of the app name or description. Even during some followup meetings we had with the SfN management and people from Oasis (NMP’s developers), I wasn’t able to persuade them that “Hack” had a positive conception. Too bad! So long HackSFN: welcome Hubbian! Long story short, we changed the web-app’s name to Hubbian. Hubbian is the contraction of two meaningful words in the field of neuroscience: Hebbian and Hub. The app was designed to promote the discovery of structural (semantic) and functional (live data/popularity) links between the abstract so it made sense: connecting the unconnected. Since then (2012), Hubbian has become a company and produced web applications for science conferences across Canada and US serving more than 20,000 online users. As of 2016, we’re retiring the app because we never managed to turn it into a lucrative business. BTW – the web app for SfN has always been provided for free to both users and SfN. My hope for the future is for the word hack to be perceived less and less confrontational and a true hackathon will be organized at SFN. I imagine a place were enthusiastic fellow scientists, computers and data sit together to find better ways to enhance the usability and the discovery of the amazing program offered by the Society for Neuroscience.